Been having trouble getting motivated to work on the 20+ tac marines, so I set them aside and just cherry picked the characters out of the last big pile to run through the batch painting machine. Figured they warranted a bit more attention than the basic troopers, anyhow! Buckle up for a mess of pics! First up is the big guy, Alexis Polux - I'm finding I'm really of two minds about the model, it's definitely a refreshing change of pace pose-wise from the bombast so commonly found in FW's character series, but that said I find his pose with the big ol' shield really covers a lot of interesting detail on his armour from view. 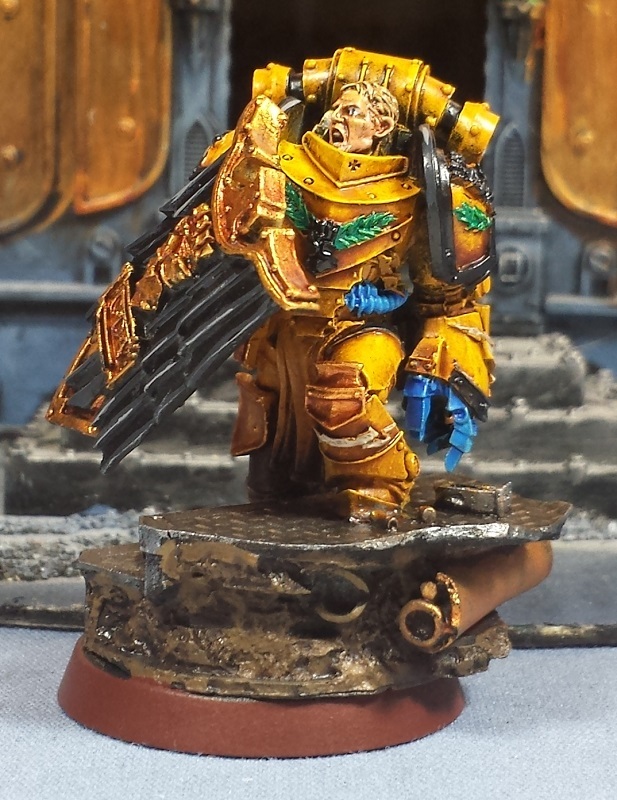 Love the power fist/melta weapon, and all the little grey knight-esque sculpted latin inlays. Just a beautiful sculpt to work with! 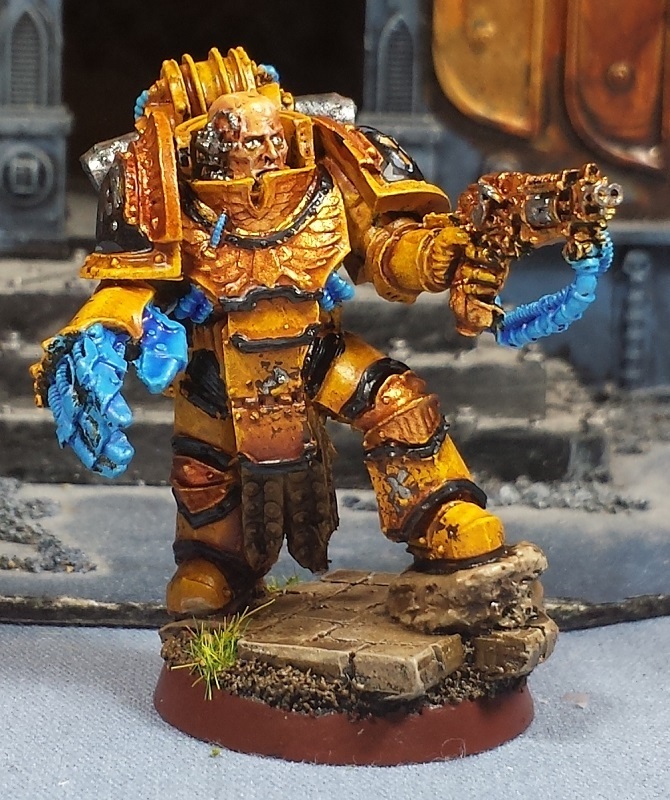 Next up is my take on Sigismund as a hold over until/if FW ends up doing their own, at which point he'll be demoted to just legion champion status. I sort of like the patchwork armour, definitely gives him a hard-fought feel. You just can't go wrong with a praetor in terminator plate, this fellow will be joining the rest of the terminators where they'll generally be teleporting in - at some point there may be a Spartan coming, but I have a feeling after I get done building the two Proteus land raiders I may suddenly have a change of heart! 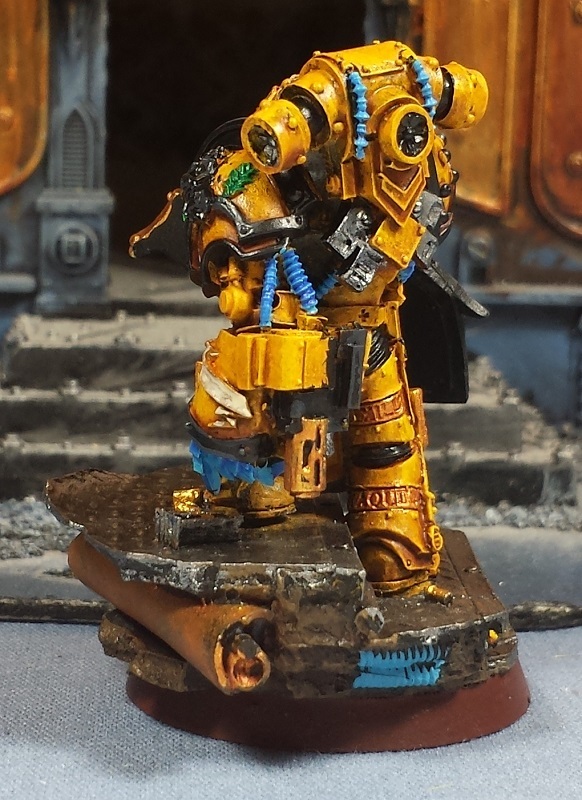 Mild conversion on the praetor in artificer armour, swapping his paragon blade for a solarite power gauntlet. 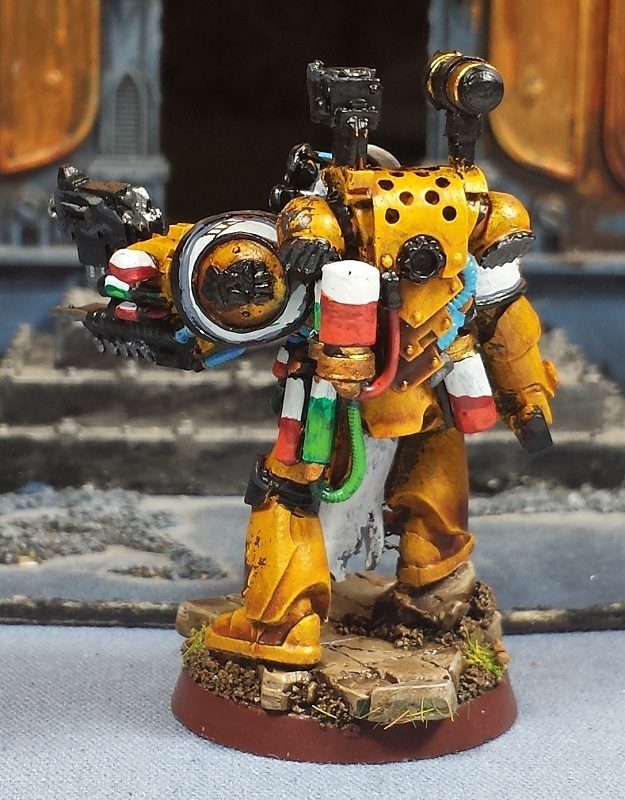 Not necessarily the best swap but befitting the Imperial Fists from a fluff perspective! 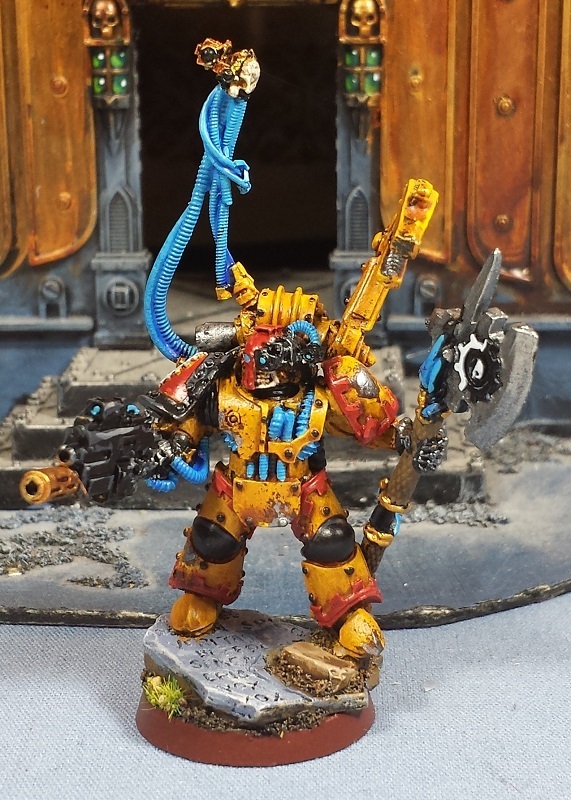 I had bits left over to build another legion champion, this one armed with a thunder hammer. He's the only one in the army wearing Mk.III plate, apparently! 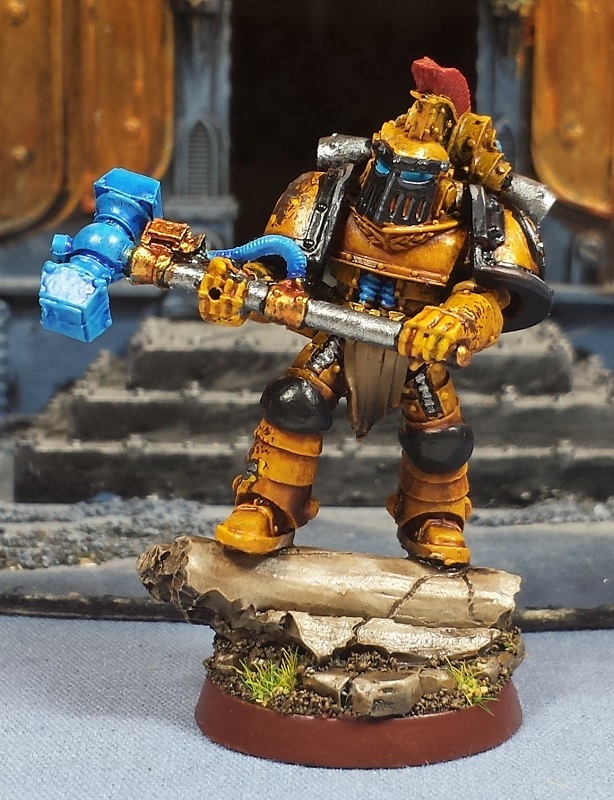 Similarly, the leftover bits from the Iron Hands army from a while back had caught my eye so I knocked together a Forge Lord for the army. With the fierce competition for HQ slots in the army however he's not likely to see much action, unfortunately. 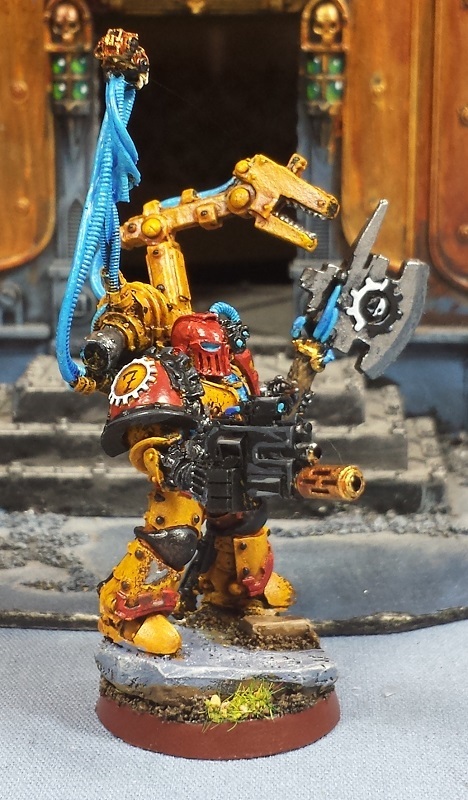 The last of the HQ models is the always surprisingly nasty Master of Signals and his Pie From The Sky attack! I absolutely LOVE this sculpt, the homage to the old RT-era model is a thing of beauty. 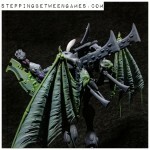 Really been looking forward to getting my hands on one to paint up! Bringing up the rear is the sole Elite choice with an apothecary in Mk.IV plate. 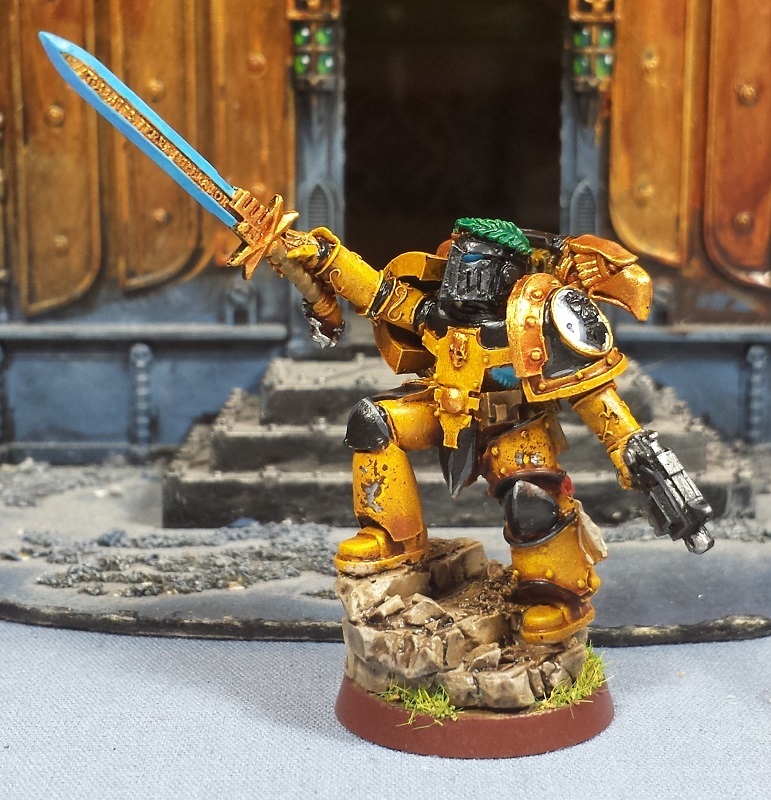 Similarly to the MoS above, I hadn't ever painted one of these models (I used the Mk.III versions in the Iron Hands and Thousand Sons armies though), but I'd always wanted to! As is always the case, doing the photo editing shows up all the little things that I've missed and have to go back and touch up - a lens here, some highlights there, a wash and gloss varnish on the other, and so on. Doh! ...then I go back and look at the minis and realize that to the naked eye (and not the automatic zoom) you can't see those mistakes and usually leave it be. Ace characters, man. Every single one looks great. You really hit the recipe for yellow, and the blue accents really set it off. I'm not really a fan of so much of the crazy blue. If it were restricted to power fields on weapons that may be alright but my eye drawn to random power cables is strange. 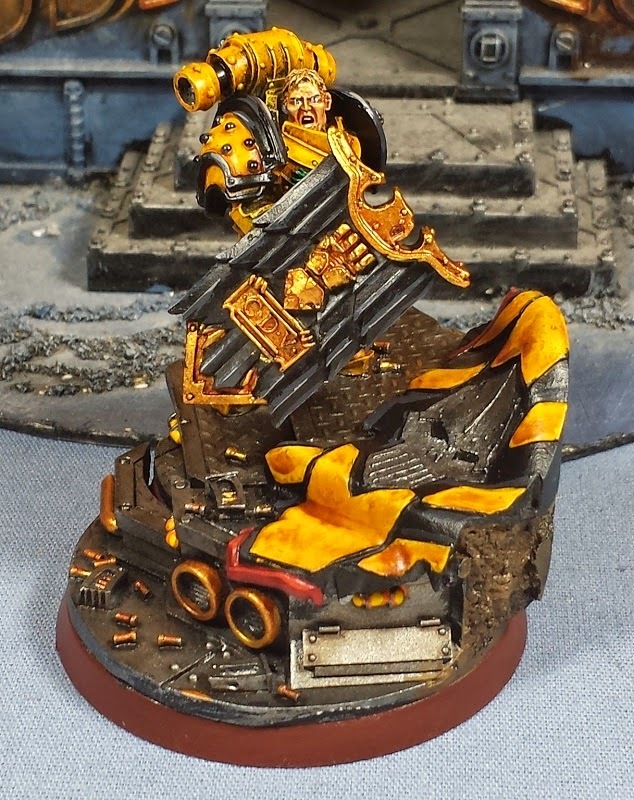 Not poorly painted or anything or inherently against the blue, but it's overused in some weird spots in my opinion. 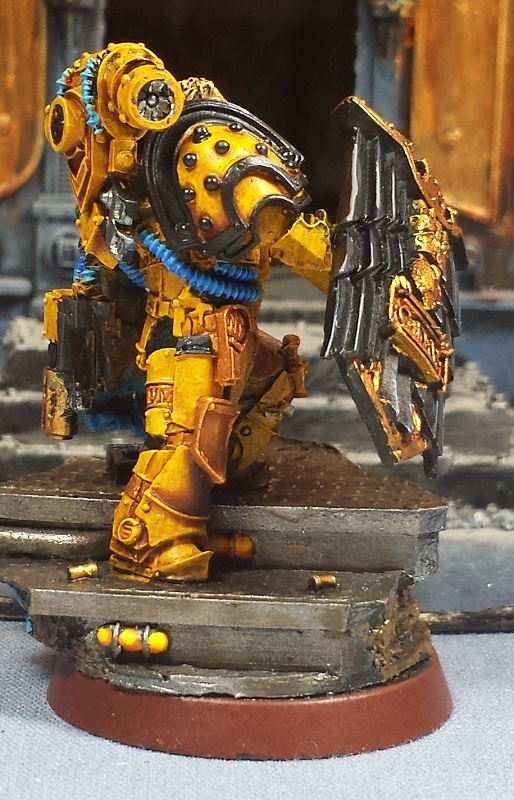 I kind of wish I'd gone with Imperial Fists instead of Dark Angels. 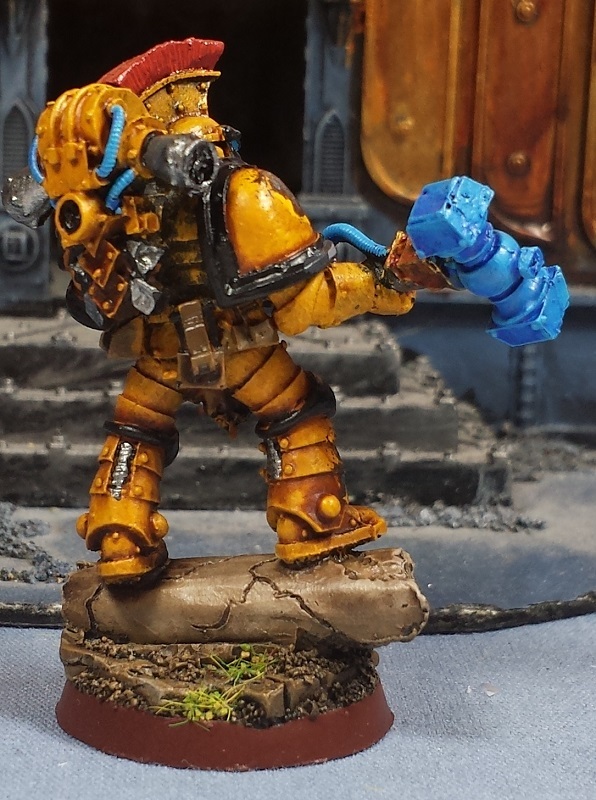 Yellow is my favorite colour and when I see them now quite often they're gritty and battleworn and sepia washes really help. 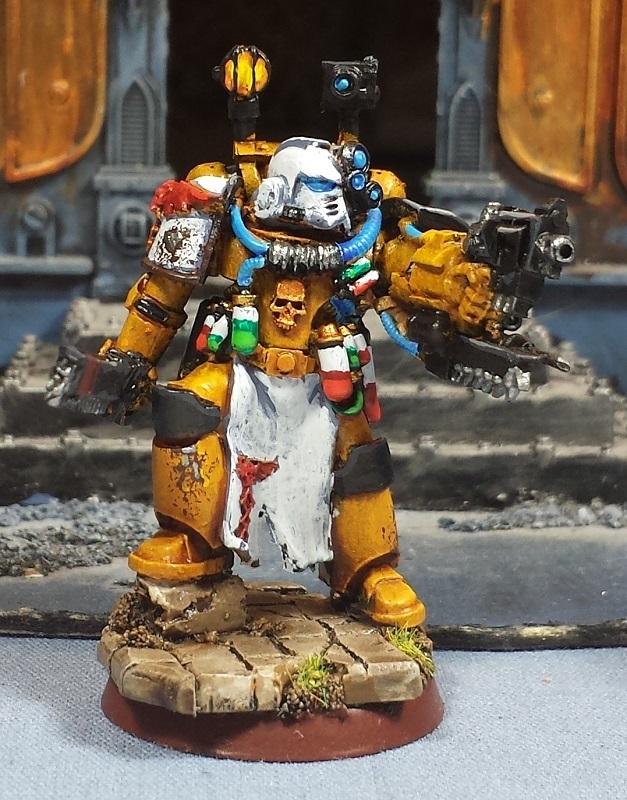 I chose DA's for the variety and the Fists weren't really covered back in the day and what with struggling with my own yellow Bloodbowl team didn't give it too much thought. I kind of regret that now but it's cool to see these. @Da Masta Cheef: Haha! A perfect analogy! @CJ Kilbride: Thanks very much, man! @TheAmbit: I hear where you're coming from - the character models tend to have a lot more of the cables and whatnot so the blue ends up being much more prevalent than it is on the basic troopers. 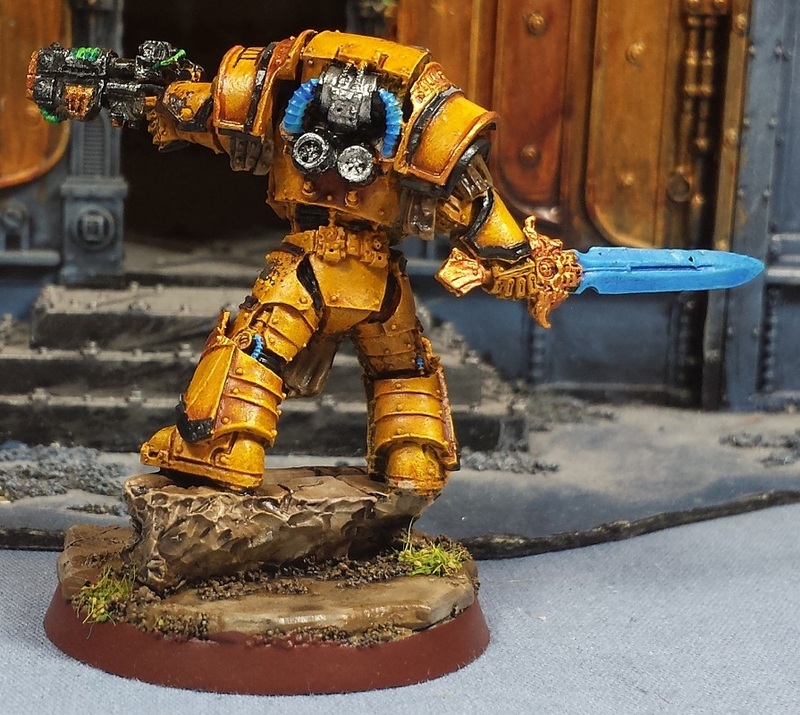 @Dave Weston: Cheers man - Most of the reason behind the IF's was to challenge myself with the yellow, I definitely struggle with the color as well. The sepia wash does wonders! If I hadn't of met you in person, I'd assume you are actually a robot. Great stuff s always Mord. Loving that electric blue. @Greg Hess: Haha! Thanks bud! @Joe B: Absolutely - It's good to do something fun in between painting big blocks of troops, keep the enthusiasm up! @Dai: Thanks man! 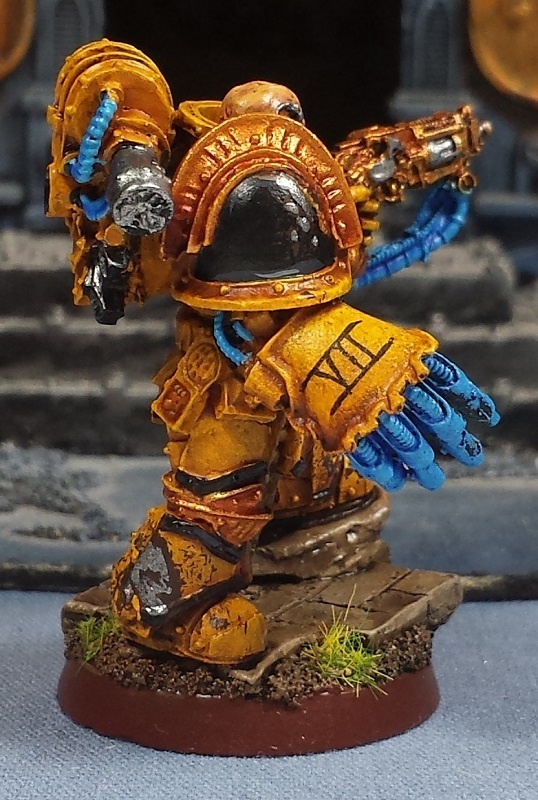 Aye, the comms officer is in my top 5 favorite minis FW has done for the heresy, lots of fun to paint up! Great work! How are you getting your yellow so strong? I am really struggling to get a decent yellow. @WandererWandering: Thanks! 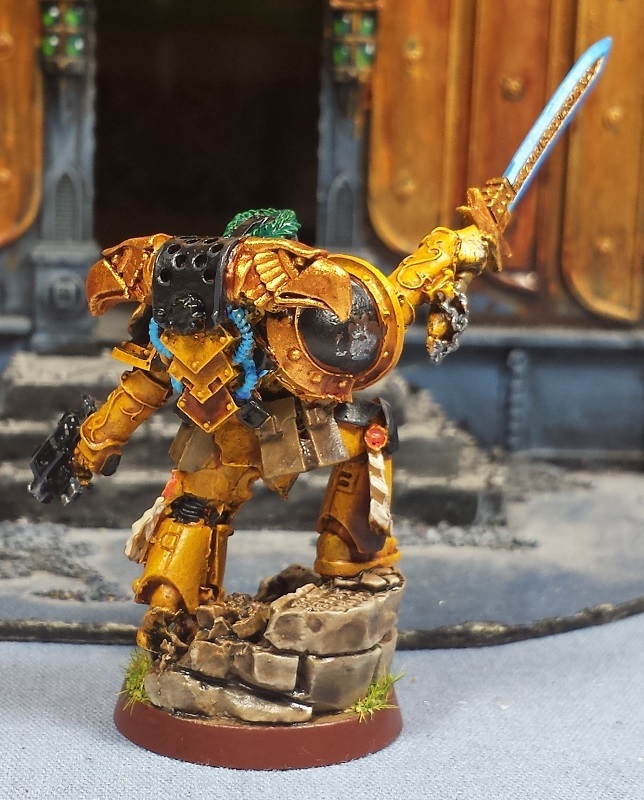 The basic recipe is a Tausept Ochre basecoat, followed by successive drybrush passes of Averland Sunset, Golden Yellow and Flash Gits Yellow, then a Seraphim Sepia wash over everything to tone it down and blend it together. I love the beaten look to their armor. Nicely done. 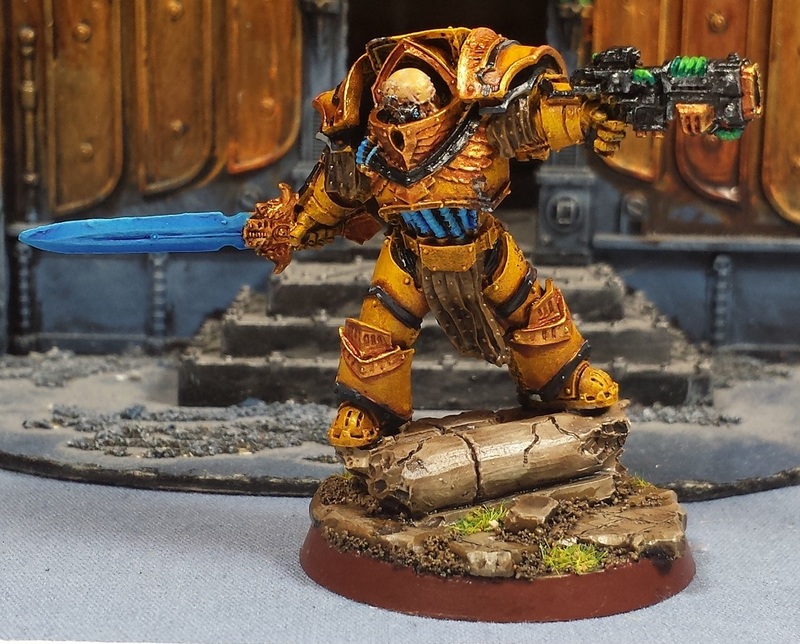 Loving Alexis, the model is lovely as is but when hit with that yellow scheme you have and the bold blue colour it really pops.